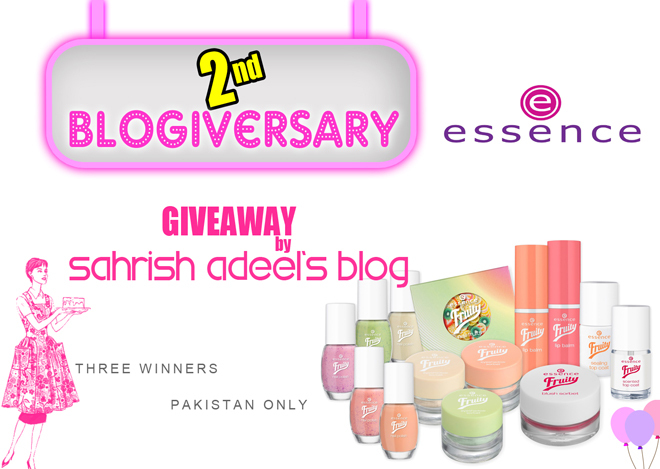 Essence Goodie Bag Huge Giveaway - Three Winners (Pakistan Only) | Sahrish Adeel - Malaysia based Pakistani Beauty & Lifestyle Blogger! Since I am celebrating my blog's second anniversary this month. I thought to post another huge giveaway on one special day, Mother's Day. This giveaway is exclusive to people residing in Pakistan. This giveaway is sponsored by Essence. I will choose three random winners at the end of the giveaway and is open to everyone who has a valid postal address in Pakistan. Winners will be notified via email and will have 72 hours to claim their prizes. To enter into this giveaway, you need to do some tasks and make your entries in the Rafflecopter widget below. Please note that I will verify the entries by myself.